Magallanes is an aging cab driver who makes extra money driving around his now senile old boss on daily trips. His boss was a once a feared colonel in the ruling regime. When a young woman gets into his cab, Magallanes is rattled to his core. The young woman was one years before he had kidnapped for his old boss to use a s a sexual plaything. Filled with guilt he decides to try and help the girl get the money she so desperately needs- but will he be able to return to his old ways to do it? The biggest reason to see this film is the work of Damián Alcázar in the title role. Alcazar gives one of those great performances where its all movement and and looks and gestures. We feel the weight of the world that is pushing down on him. He doesn't have to say much for us to know what he is thinking and feeling. This isn't to say that the rest of the cast isn't great too, more its to say that Alcazar's performance is just on another plane of good. He's the one that hooks you and drags you along to the end. I'm not going to lie, the plot isn't anything we haven't seen before. Plots like this are standard issue film noir or neo noir. Odds are you could write pieces of this yourself .If a film is going to become compelling it has to transcend the familiarity with something special. Fortunately MAGALLANES manages to add just enough spice to make one damn fine and compelling film. The spice here comes from the reflections of the political situations in the plot. The Celina, young woman Magallanes helps is from the native population so that she was and is looked down upon by the ruling classes. There are also implications of past crimes, the change in society and position over the years. For better or worse the Shining Path insurgency changed things. The sense of a world changed bleeds off the screen. We feel as though all of history is pressing down with us and catching up to the characters. While I've seen many films that had their worlds bleed off the screen I've never seen one where the backstory did. I really liked this film a great deal. This is a film that has grown in the day or so since I saw it. I spent several hours trying to write it up but I couldn't do so, something was off and I couldn't find a way to discuss it. There was a literal hole in my review. But after almost a day of contemplation I came back to this piece. The flaws, largely due to the familiarity of the plot, softened in my eyes. 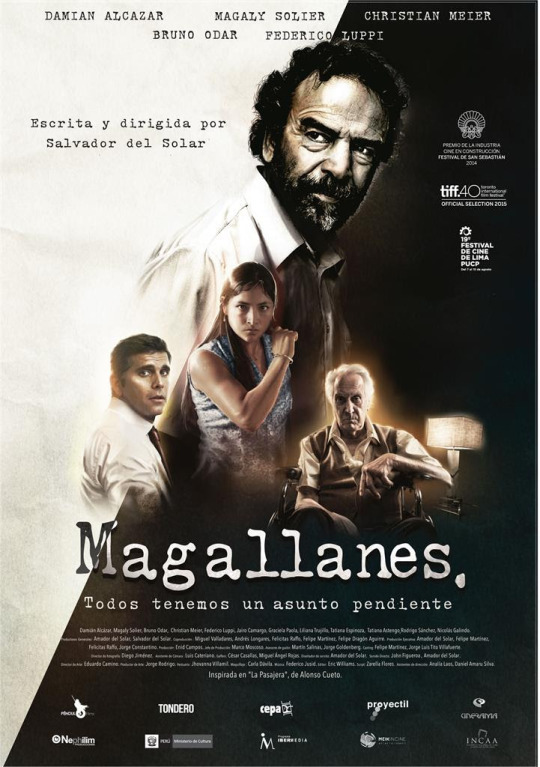 If MAGALLANES isn't perfect it's a perfect representation of his characters. While the general story is familiar, that only because this great little film looks, as we all do like our parents. And as we hope about ourselves and our children it is something greater than it's parentage. This is a super film and I can't wait to see it again and more importantly, to get it in my collection. See MAGALLANES when you can. For tickets and more information on the Toronto Film festival screenings go here.